Weekly Entertainment | Hill End, Entertainment | Out of Sight, Out of Mind? 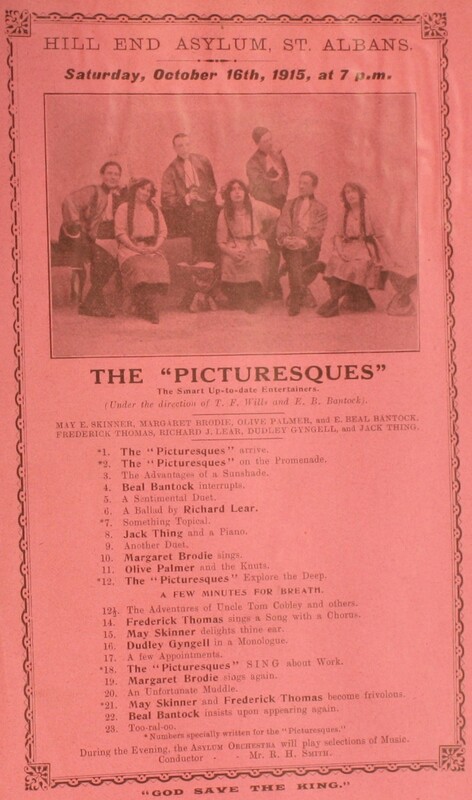 Vaudeville Entertainment by "The Ladybirds"
These four images show the sort of entertainment the patients and staff at Hill End would receive. They are each something new and different, and at the end of most of the entertainment ‘God Save The King’ would be played. 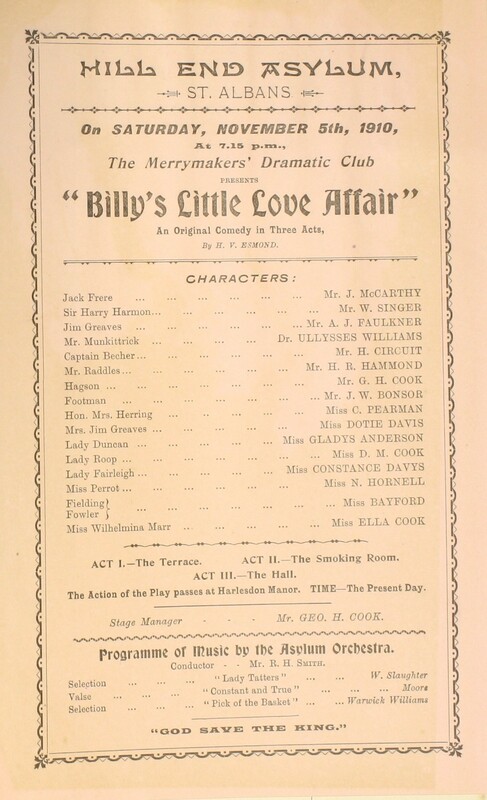 (This can be seen at the bottom of each programme.) 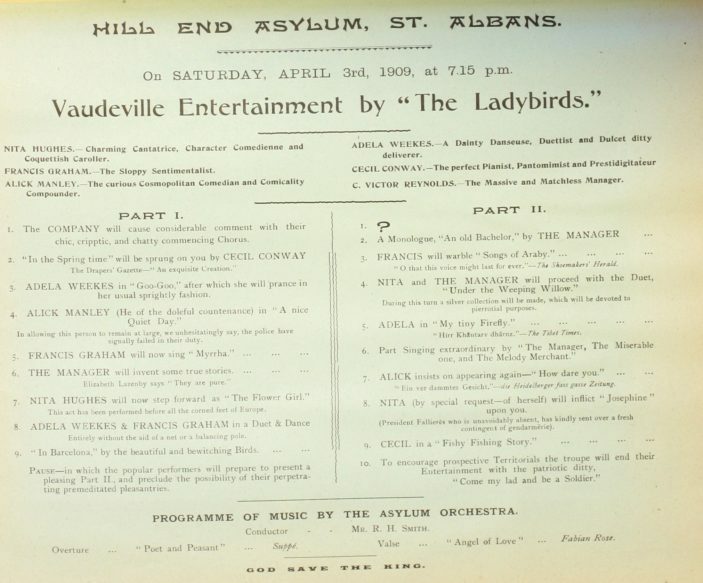 Also the asylum’s orchestra usually played after the entertainment. 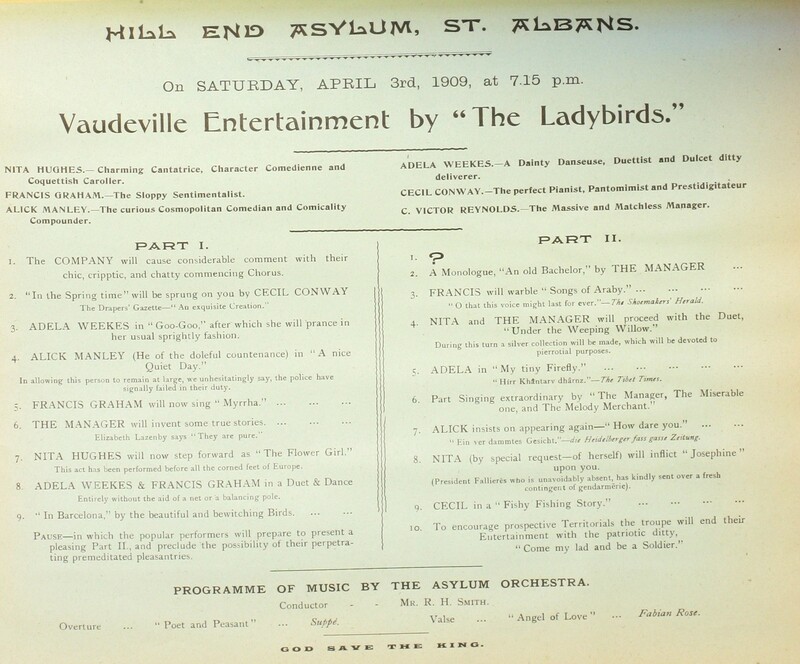 The second leaflet illustrates the high quality of the shows performed at the asylums (see also Memories of wartime at Hill End hospital). John Nevil Maskelyne (1839-1917) of Cheltenham trained as a watchmaker, but was also an inventor – the lock for London toilets which required a penny to operate (hence, ‘to spend a penny’) was his creation – and became interested in conjuring, after watching a performance of the fraudulent spiritualists, the Davenport Brothers. Following the publication of Charles Darwin’s The Origin of the Species in 1859, debates about religion and rational science led to the rise of some dubious spiritualist performers. Maskelyne, with the help of friend and cabinet-maker, George Alfred Cooke, built a spirit cabinet, and together exposed the Davenport Brothers at a public show in Cheltenham in 1865. Inspired by the acclaim they received, the two men decided to become professional magicians, and had a famous tenancy at the Egyptian Hall in Piccadilly, from 1873 to 1904. They invented many illusions still performed today, one of the best-known being levitation. 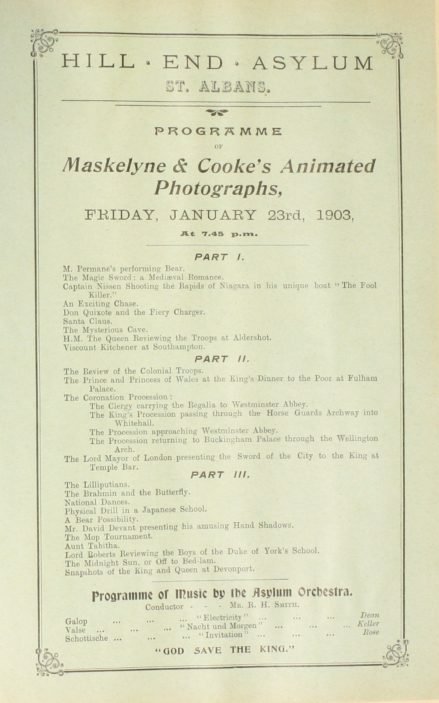 Like Houdini, Maskelyne tried to dispel the notion of supernatural powers and, in 1914, founded The Magic Circle’s Occult Committee, whose remit was to ‘investigate claims to supernatural power and to expose fraud’. In particular, the committee attempted to prove that the Indian Rope Trick has never been performed. 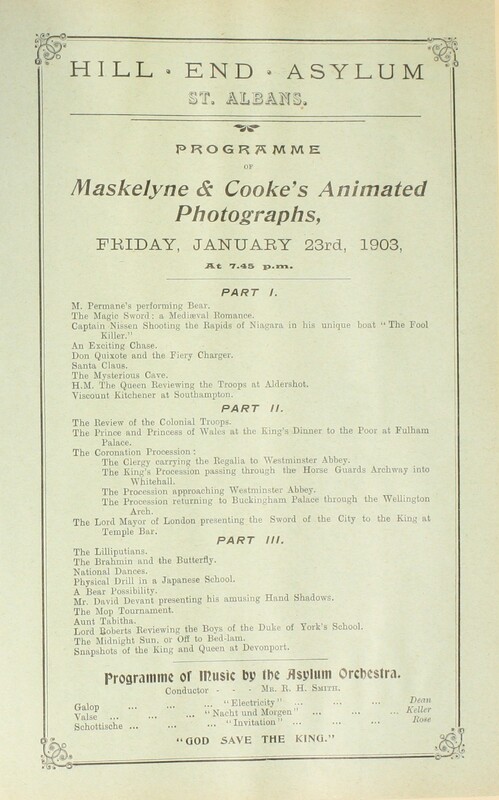 Maskelyne was the father of Nevil Maskelyne, and the grandfather of Jasper Maskelyne, both noted magicians. The latter, working with The Magic Gang under General Wavell during the Second World War, created large-scale military ruses, deceptions, and camouflage, including masking Alexandria and the Suez Canal, and creating the illusion of a large armoured force prior to the battle of El Alamein. Sources: ‘The Rise of the Indian Rope Trick’ by Peter Lamont; Wikipedia.